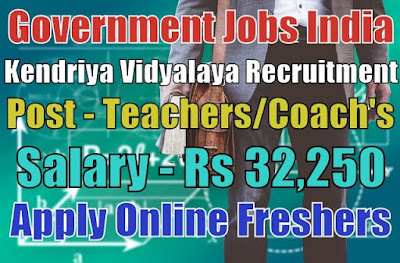 Kendriya Vidyalaya Recruitment 2019-20 notification (Ministry of Human Resource Development, Government Jobs in India) for Various teacher, primary teacher and various posts. All legible and interested candidates can apply on or before (12-02-2019). Further information about the Kendriya Vidyalaya recruitment courses and exams, vacancies, salary details, KV careers, application fee, KV online recruitment, login, fresher jobs, results, educational qualifications and all other details/information about these posts are mentioned in details below. The job location for candidates will Be Jalandhar (Punjab). Salary/Pay and Grade Pay - For postgraduate teacher posts, the payable salary will be Rs 32,500, for trained graduate teacher, computer instructor and counsellor posts, the payable salary will be Rs 31,250 and for all remaining posts, the payable salary will be Rs 26,250 per month. Further information about salary details is mentioned in the detailed advertisement. How to Apply - All legible and interested candidates have to download an application form from official website www.kv3jrc.org or from the given link below. Last Date for Submitting Application Form - All candidates must apply on or before (12-02-2019). After the last date, no application form will be submitted. Application form can be submitted via online mode only.